EDIT: This article has been updated to reflect the new registration requirements as of Jan 2018. You are now required to register all drones (hobby and commercial) if they are between .55lb and 55lb. The drone market has exploded in the past few years, and experts like Goldman Sachs are forecasting continued growth in consumer, commercial, and civil markets; specifically in the construction and agriculture segments. So it’s no surprise that more and more people are looking at becoming a drone pilot. More than 60,000 Drone Pilots have been licensed in the US since the FAA requirements went into effect in August 2016 and thousands more are sure to come. Compare that to the ~125,000 commercial manned aviators in the U.S. and you can see that there is a virtual gold rush in the unmanned industry. 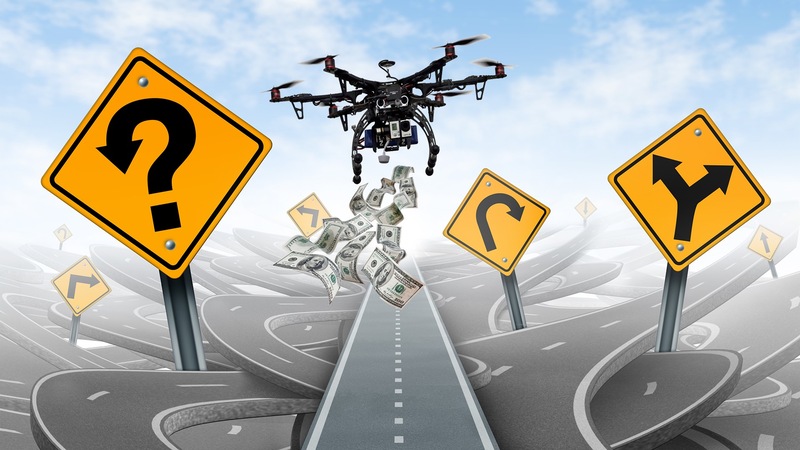 But, before you rush out and stake your claim to the untold riches of the unmanned industry, it’s best to take a few moments to think about whether or not the Part 107 license is right for you. Whenever someone asks me, “Should I become a drone pilot?”, I answer with, “Yes, you should but maybe not a commercial one.” There is a distinct difference between the two and it’s an important one to understand before you expend the time, energy, and money to get a license. So, flying for fun, not for money, but still following the rules…that’s a hobbyist drone pilot in a nutshell. Now, what’s a ‘Commercial Drone Pilot”? A commercial drone pilot is exactly what the name indicates; it is anyone who flies their drone for commercial purposes (meaning they receive money or other compensation for the use of their drone.) So, if your neighbor wants to give you $20 to take a picture of their roof for their insurance company; that’s commercial use. Wedding photographer who wants to use a drone to get one cool overhead shot; that’s commercial use. Guy who wants to take ‘artsy’ black and white aerial photos of the city skyline and then sell prints of those photos on the sidewalk of said city; that’s commercial use. Basically, anytime you use a drone for the financial benefit of yourself or your company, you’re probably looking at commercial use. Still unclear if what you want to do is considered ‘commercial’? Know Before You Fly has a pretty good explanation here. In order to operate a drone for commercial purposes, you need a Remote Pilot Certificate with Small UAS Rating. Most people will refer to this as a Part 107 License (named after the section of the CFR that regulates drones) or just a Drone Pilot License. To get this license, you need to be a human being, at least 16 years of age, and capable of safely operating a UAS. You also must pass a 60 question exam administered by the FAA. This exam costs $150 and covers basic Airmanship, Weather, Regulations, Airspace, and other pilot-y topics as well as some drone specific information such as maintenance best practices and UAS flight limitations. If you’re interested in getting your Remote Pilot Certificate, you should start here! While the industry is growing, a low barrier to entry means that the supply of licensed pilots is growing quickly too; resulting in some pilots making as little as $10/hr. while the national average is right around $40,000/yr. Essentially, being able to just fly a drone is good but being able to do something with the video/data you collect is even better. The safety and proficiency benefits of preparing for the exam will help all pilots, regardless of whether or not you intend to fly as a full-time career. Even if you don’t fly full time, people will randomly ask you if you can video something, or take a picture of their house. In these cases, it’s nice to be able to legally make a few bucks in the process. So, to sum it all up and answer the question we started with; Yes you should become a drone pilot! *’EVERYONE’ = anyone who can fly safely while respecting the rule of law and the integrity of our national airspace. Previous	Plan on Flying Your Drone This Winter? NextHow Did a DJI Phantom Crash Into a U.S. Army UH-60 Black Hawk Helicopter?